Hood River Hobbies Tactic DroneView Mini Camera Wi-Fi 720p High-Definition First Person View for Sport and Hobby Live Streaming Video and Still Photography #TACz1000 Mount it on a drone or RC plane and more! 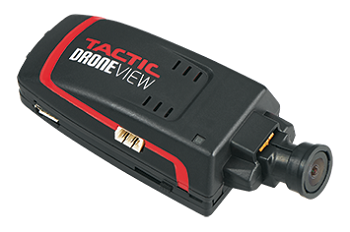 • Enables you to watch FPV (First Person View) action in real time on your mobile device and shoot 720p HD video or 1MP still photos. • Use the free DroneView app to adjust camera features and to stream videos and photos via Wi-Fi to your Android or iOS mobile device. • Measures just 3.1 x 1.3 x 0.9 inches (80 x 34 x 24 millimeters) and weighs just an ounce (27.5 grams). Also offers audio capability. • Includes a 4GB micro memory card, on-board battery, ZH port for remote functions and receiver charge leads.